SONC offers the traditional format of league-style bowling for singles competition and singles ramp (assisted & unassisted). In doubles and five-person team competition (traditional and Unified Sports), SONC uses the Baker System format, which places emphasis on the team effort rather than individual accomplishments of team members. Doubles or team members take turns bowling frames within one game, as opposed to team members bowling individual games and combining the scores for one team score. Click here for a full list of Summer Games registration forms. SONC Summer Games will be held May 31 – June 2, 2019 in Raleigh. Athletes and partners also have the opportunity and are encouraged to participate in various local invitationals. Check the bowling sport calendar for upcoming invitationals being hosted by local programs. If you are interested in hosting an invitation please contact the sports department at sports@sonc.net. About Bowling: This sport is one of the most popular at SONC Summer Games hosting over 300 athletes and 25 Unified Partners. 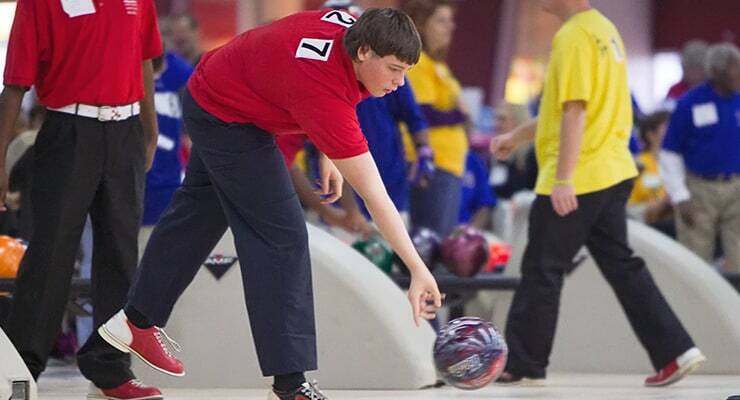 Differences of Special Olympics North Carolina Bowling: Special Olympics allows the use of ramps by athletes who do not have the physical ability to roll a ball with their hands. Additionally, SONC uses Bakers Format which places emphasis on the team effort rather than individual accomplishments of team members. History: Bowling made its’ first appearance in the 1985 state-level competition in Wilmington. Bowling later joined the SONC Summer Games in 2016. In 1991, SONC sent 8 athletes and 2 coaches to the International Special Olympics Summer Games in Minneapolis, MN. In 1992, SONC and and a few local programs hosted several competitions which really was the kick start for bowling.